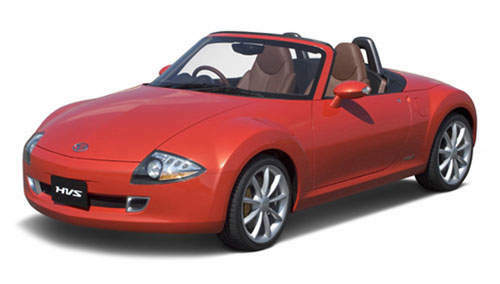 The Daihatsu Hybrid Vehicle Sports Concept is a lightweight sports car that puts emphasis on the joy of driving together with ‘environmental compatibility’. I like the term they use – environmental compatibility! Daihatsu says the HVS Concept gives you the performance of a 2.0 litre car with better fuel economy than a 1.0 litre car. How does this hybrid system work? The HVS Concept is powered by a 1.5 litre DVVT DOHC engine and three motors. A combination of these are used in an advanced 4WD system optimised for sporty driving. Two of the electric motors power the front wheels while one electric motor powers the rear. The torque control mechanism in the 4WD system controls power given to the rear left and right wheels separately and independantly. The result is a combined fuel consumption of 4.1 litres per 100km. 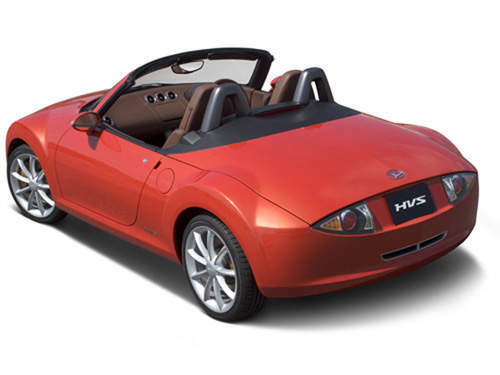 The Daihatsu HVS Concept is a 2-seater. Dimensions are 3715x1695x1235 (l x w x h). The front motors are rated at 36kW and the rear is a left-right controllable 20kW motor. These electric motors draw power from a Nickle Hydride battery system. The petrol engine is a 1.5 DOHC with DVVT rated at 77kW at 6000rpm with 140Nm of torque at 4400rpm. The car also comes with a CVT transmission.